If you want to become a member of the Nordic Roaster organisation 2008 you can sign up here. The membership is 100 €/ year. To enter the annual Nordic Roaster competition you have to be a member. As a member one roaster from your company can attain the gatherings where all members meet for a lecture or to to exchange knowledge. Next member meeting will be 21st of June 2008 at Kontra Coffee in Copenhagen where there will be a cupping. After that Nordic Roaster members will meet Saturday 13th of September 2008 at Nordic Barista Cup in Helsinki. Here the theme will be “Fire in your roastery”. 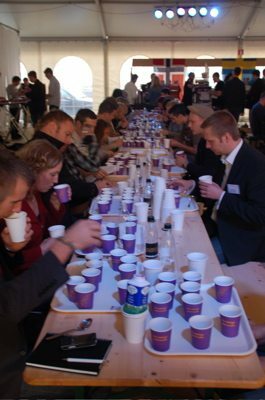 Further more Nordic Roasters members will also make an individual cupping at the Nordic Roaster compeititon in order to make a description of the competing coffees and a motivation for the winning coffee.